Brewday was scheduled for Saturday December 22, 2012. This was my first day of vacation for the holidays (had use or lose time by the end of the year). The day before I decided to take the metro and walk to the DC Homebrew Store located at 3 Stars in D.C. on my way home from work. A quick check of google maps, and I figured I would be able to hit the brew store, and only increase my commute by a 45 minutes...well it ended up being a good 25 minute walk from the nearest metro station each way. In addition, when I got to the train station to catch the MARC commuter train, the schedules had been rearranged for the holidays and I had to wait an extra 30 minutes for the next train. In addition to the time, the weather was not in my favor as it was low 30s and snow flurrying - if you don't consider that dedication to brewing with fresh and quality ingredients, then I don't know what you would. On the aforementioned MARC commuter train I spend my time reading. Recently, I was reading the autobiography of Benjamin Franklin and in a passage he described how at the Printing house he worked at, all the other workers would be drink beer all day - before, during, and after every meal. 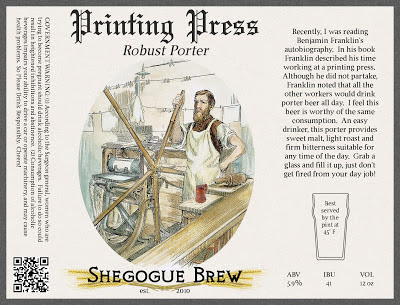 Around the early 1700s I would assume the ale they were drinking were similar to a porter style, and have therefore deemed this beer, a modern interpretation of the style, Printing Press Porter. This porter appears almost black in the nonick pint glass I am drinking from and has a tan head of foam, with great lacing. Smells of sweet malt, slight roast and earthy hops dominate the aroma. The beer has medium body and medium to high carbonation. The flavor is dominated by english hop character and a clean malt backbone with just enough dark malt character to produce a crisp bitter finish. 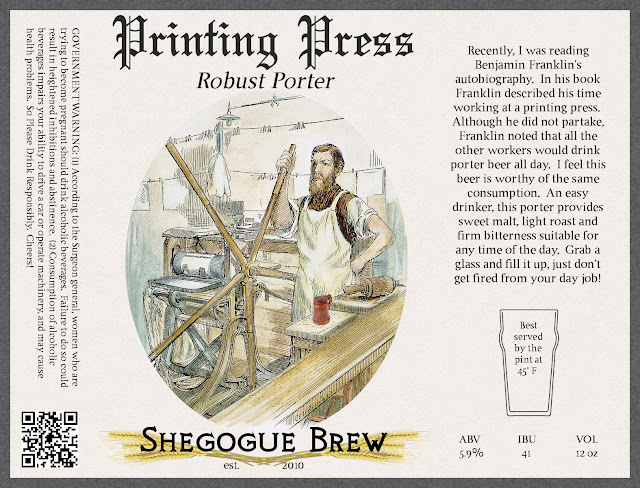 This beer is easy drinking and could definitely be consumed throughout the day at your printing press job. I really enjoy drinking this beer. The inner beer nerd can continually sip and pick out subtle nuisances, but the regular beer drinker will be able to toss them back as each sip finishes with a dryness, not expected from the final gravity. The bitterness of the hops and the dark malts keep this beer in check. I plan on trying to keep a variation of this in the pipeline in the future. Its a versatile style which can showcase english, or american hops in the finish. Be on the lookout for future additions. Sounds tasty. I like the label!